Changing pace today, since I actually used my sewing machine for a quick project yesterday. 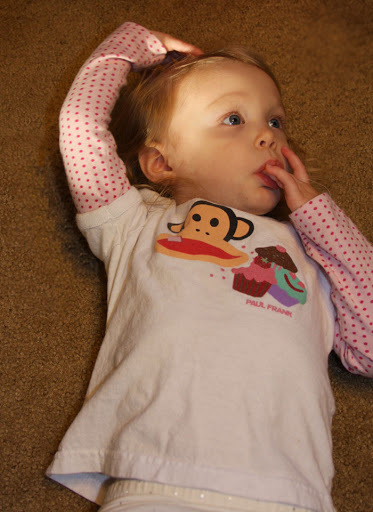 I’ve been finding more sewing blogs to follow lately–particularly ones about altering tee shirts and pre-existing items–and a couple of them had tutorials up for how to convert little girl’s tee shirts into long sleeved ones with outgrown leggings. Because raising a girl right now, it’s all about leggings and I’m willing to bet that everyone has some. In fact, The Girl had just outgrown a few fun pairs and some were too short now that Fall seems to have landed in Alabama. So I took a quick glance at how it was done and decided to try it out on my own. First, I picked out a favorite short sleeved shirt and a pair of leggings that coordinate nicely with it. Gotta love the clearance section: I believe I snagged those leggings for $1.99 at Old Navy back in the day. I loved the fun print and the button details on the legs. And like all good Americans, I’m a sucker for a clearance rack. For cheap clothing alterations, that’s a good thing. I then laid the leggings out flat on my rotary mat and cut the legs off just a little longer then the measurement I took. I believe I did something right in the middle of 9.25″ and 9.5″ ( 9 3/8″ ?) for a measurement of 9″ on the original shirt sleeve. I wanted to make sure that I didn’t accidentally short the sleeve by doing the exact amount. Since the sleeve was going to need to be tapered–the leg opening was much wider then the sleeve opening was–and I didn’t want to touch the side with the buttons, I pinned the leg to the cuff starting on the button side. (I attempted to make the buttons facing out and this didn’t quite work out how I thought it would.) This left the excess leg on the side. 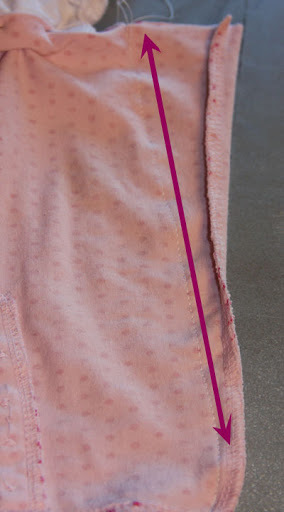 I marked where I wanted to start sewing with a vertical pin and then sewed from there. I didn’t use a guide, just gently tapered down the leg, but I’m not as picky about accuracy with some things. Your mileage may vary. I used a line to show more clearly where the seam was sewn to take the excess out of the leg. (On this particular leg, I could have started a bit closer to the sleeve, since I had to fold it in a bit to make it fit. I remedied that the second time around.) I then took my rotary cutter and trimmed the excess, leaving a small amount of fabric outside of the seam. Then I went to my sewing machine and with some finagling got it properly set up to sew the sleeve into place. I used the “rim” of the cuff as a guide to line the jersey up to and used the little indentation on my sewing foot to align that all with. 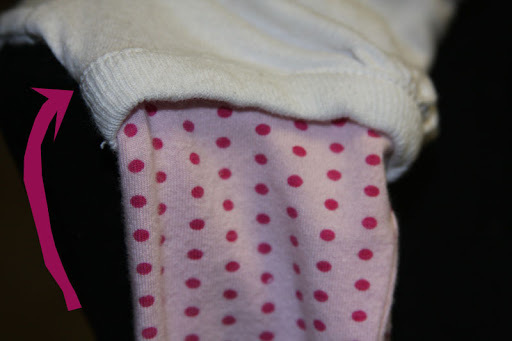 The seam allowance on the inside is very thin, but I wasn’t too worried about it for this project. this is what I had. I used another lovely arrow to point out that seam on the cuff I’ve been babbling about. Then I repeated the project for the other side and TA DA! Super cute new fall tee shirt for The Girl. She did not feel like modeling for me so I could get a decent picture: this is as good as it got last night. Start to finish, this project took less time then it did for me to write this blog. It was all done in less then 20 minutes. I will definitely be doing this again with a few more pair of favorite, but no-longer-fit leggings and equally loved short sleeve tees. Great idea! and a cute finished shirt. I don't sew but I like what you've done.